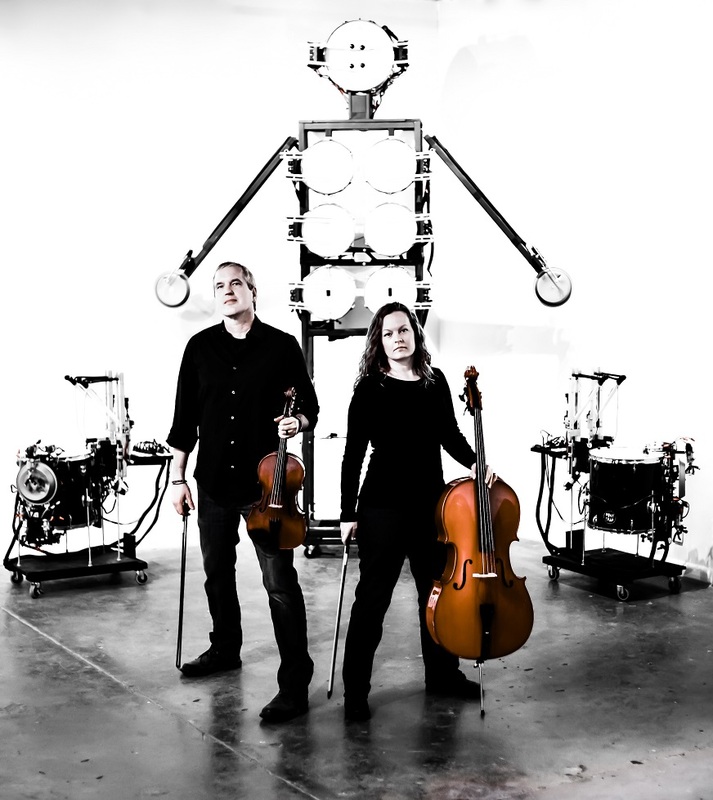 Billing themselves as “industrial music for modern primitives,” Ponytrap is a decidedly unconventional Austin trio, utilizing viola, cello, and robot drummers to create a soundscape that careens from delicate and haunting to fiery and intense. Hilary and Quentin Thomas-Oliver are the only warm-blooded members of the band. Their rhythm section is an assemblage of analog-programmed robots, including two floor toms and a twelve-foot-tall human-shaped tower of drumheads. Quentin Thomas-Oliver is the mastermind of the project, having learned that creating his own robot drummers from scratch was less challenging than finding the right human for the job. Quentin originally moved to Austin, Texas to attend the College of Engineering at UT, but dropped out to play bass in a hard rock band. He returned to school after seeing a play about 18th-century violinist and composer Niccolò Paganini, which led to an epiphany about combining classical instruments with modern tribal industrial music. Ultimately, Quentin graduated with Honors and Distinction with a degree in Strings Performance from the University of Iowa School of Music and started working to build the band that would be Ponytrap. Several unsuccessful human permutations later, he decided to build his own drummer. Hilary Thomas-Oliver brings the perfect layer of feminine energy to the project, with inspirations ranging from Lizzo, Liz Phair, REM, Neil deGrasse Tyson, and Samantha Bee. She played cello in the school orchestra as a kid, and picked it up again as an adult after Quentin brought home a beat-up cello from his job in a music shop.